The federal minimum wage rate is $7.25 an hour. It applies to hourly employees and has been in place since 2009. The states also set minimum wage rates that are above or below the federal rate, and several states have no minimum wage rate at all. In those latter states, and in those states with no minimum wage laws, the higher rate is supposed to apply. A single person under the age of 65 is considered to be living below the poverty level if they are making less than $12,486. The act applies to around 84 percent of the U.S. labor force or 130 million workers. 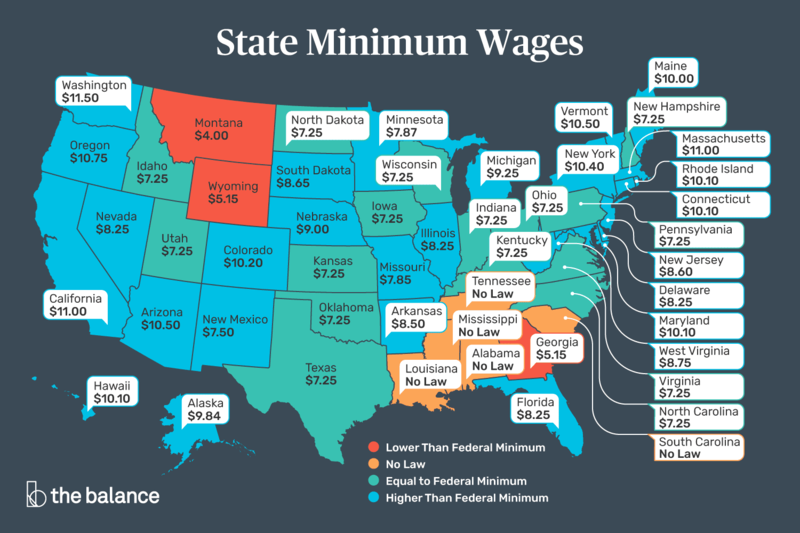 The states also can set minimum wages that are above or below the federal rate. In those states the higher rate is applies. I mention all this because my home state, Illinois, plans to raise its minimum wage to $9.25 per hour next year and to $15 per hour by 2025, and the usual controversy has begun. Why do we have minimum wage laws? These laws tacitly acknowledge that at the lower end of the wage scale, employees have much less negotiating power than do businesses. These laws also acknowledge that many, if not most, businesses will pay workers as little as necessary to attract workers, and this amount frequently leaves workers in poverty. 1. Proposed minimum wages are almost always arbitrary and never based on sound economic analysis. Why $10.10 an hour and not $9.10? Why $15 an hour and not $16 an hour? #1 is fundamentally true, though it is a red herring, mostly because such an analysis is impossible. There are far too many too many competing variables. Some people will benefit; some will be injured, and by varying degrees. Some businesses too, will benefit and some will not. How would the competing benefits and injuries be weighed? But all of the above is true of most laws. Should the fine for speeding be $50 or $100? Should a jail term for a crime be 1 year or 10 years? How is that determined? Although America has many thousands of city, county, state, and federal laws, very few are subject to “sound economic analysis,” for the same reasons as our own personal decisions seldom are subject to “sound economic analysis.” Too many competing and non-comparable variables. #2 also is true of most laws, particularly federal laws. But federal minimum wage law merely is a bottom, from which cities and states may deviate upwards. In that sense, it is more flexible than are most federal laws. 3. Minimum wage laws require costly taxpayer-funded monitoring and enforcement mechanisms, whereas market wages don’t. All laws require monitoring of some sort. The objection really is an objection to any minimum wage laws. Said another way, the author implies that minimum wage should be $0. This directly contradicts his earlier objections: (#1: “Why $10.10 an hour and not $9.10?”) Why $0? What is his “sound economic analysis” that shows minimum wage should be $0? And (#2: “A uniform federal minimum wage may be sub-optimal for many states . . .”) A $0 minimum wage surely will be “suboptimal for many states, counties and cities.” But what prevents powerful employers from paying starvation wages to weak, desperate employees? 4. Minimum wage laws discriminate against unskilled workers in favor of skilled workers, and the greatest amount of discrimination takes place against minority groups, like blacks. Again, this begs the question, what level of pay is acceptable in today’s America, or is the author suggesting we should return to slavery? 5. Adjustments to total compensation following minimum wage laws will disadvantage workers in the form of reduced hours, reduced fringe benefits, and reduced on-the-job training. “Adjustments to total compensation following minimum wage laws in the form of reduced hours” means the people will work fewer hours for the same pay. Is this a bad thing?? 6. Many unskilled workers will be unable to find work and will be denied valuable on-the-job training and the opportunity to acquire -jobexperience and skills. On-the-job training for minimum wage jobs generally is itself, minimum, and most often is of scant value. Handing off a burger or greeting a customer at the door, does not provide valuable on-the-job training. Again, the author does not explain what level of pay is necessary to provide that training. Presumably, no level of pay is low enough to satisfy his criteria. 7. Minimum wage laws prevent mutually advantageous, voluntary labor agreements between employers and employees from taking place. 8. To the extent that higher minimum wages result in lower firm profits and higher retail prices, that’s a form of legal plunder by workers from employers and consumers that is objectionable. Even a 1 cent minimum wage fits that description. Once again, the author naively opts for a $0 minimum wage. 9. Market-determined wages are efficient, whereas government-mandated wages create distortions in the labor markets that prevent labor markets from clearing. No definitions are given for “efficient,” “distortions,” and “clearing.” Is it “efficient” for a person to work 40 hours a week and still not be able to afford life’s necessities? Are markets distorted when a low-paid person makes one thousandth what a highly paid worker makes? Similarly, when unions strike for wages and benefits, is that an example of “market-determined” efficiency? 10. 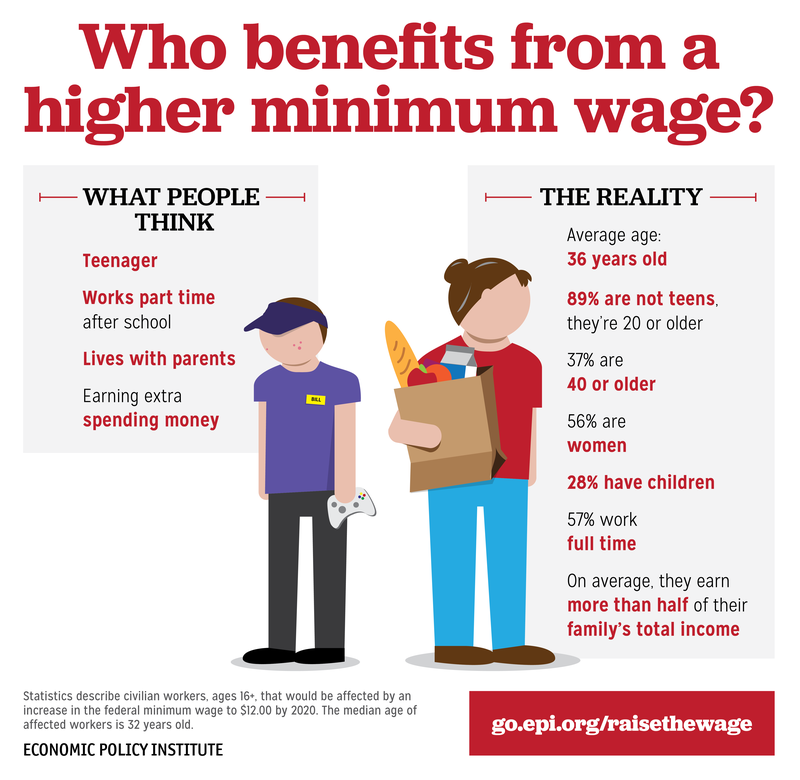 Like all government price controls, minimum wage laws are distortionary. If you trust government officials and politicians to legislate and enforce a minimum wage for unskilled workers, you should logically trust those same bureaucrats to set all prices, wages and interest rates in the economy. Realistically, if you agree that those economy-wide price controls would be undesirable, then you should also agree that the minimum wage law is also undesirable. Forgetting for a moment that government price controls set maximums, and minimum wage sets minimums, the government already does many things to set prices on things. Medicare, for instance, one of the most popular social benefits in history, already sets maximum prices on thousands of procedures and drugs, by virtue of its compensation schedules. Many state and local government set maximum prices on electricity, water, parking, and the largest single expense we all pay: Taxes. The notion that governments are incapable of setting a minimum on wages simply does not square with the facts. Minimum wage laws benefit America, because allowing powerful companies to pay starvation, or even below-starvation, wages is not in the best short-term or long-term interests of America. Minimum wage (red line) has not kept up with inflation (blue line). The sole question is not “whether” there should be minimum wage laws, but rather “at what levels” those wages should be. I suggest that no one ever should be paid at a poverty level. Though all of America is subject to various levels of minimum wage, the nation’s economic growth has been impressive, while unemployment is low. This belies the author’s contention that minimum wage laws, in of themselves, are harmful. Of course, minimum wage laws would be much less needed if the nation adopted the “10 Steps to Prosperity, below. The Ten Steps would cost businesses and taxpayers nothing, and would not discourage hiring.